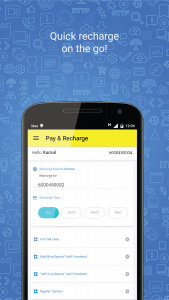 Dear friends today we are going to introduce you an interesting mobile application that will help you very much if you are an Idea cellular customer, The application name is ” My Idea ” You can search and download if from google play store or by clicking below link which we will provide you in the end of this post. 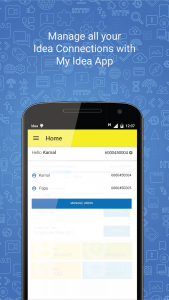 This application will help whether you have a Prepaid or Postpaid connection, this Application will simplify your life very much and its loaded with some great features. You can manage multiple Idea connections using this application in just one phone, by using this application you cann view details of your linked accounts, recharge, make payments, activate packs and services for all with just one login. You can get a summary of your last 5 online recharges or payments.